The current images of Somalia are those of a country ravaged by a 22-year dictatorship and perpetual civil war. 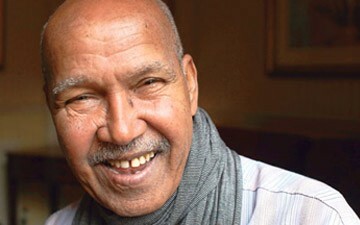 Yet through 12 books and countless essays centered on Somalia, author Nuruddin Farah has refuted those images of his homeland and solidified his place as one of Africa’s leading literary voices. EBONY spoke with the global activist and educator on how he keeps Somalia alive through his writing. EBONY: Growing up in Somalia, books were not easily accessible. At what point did your interest in literature pique despite not having books at your fingertips? Nuruddin Farah: Books for children specifically and books in general were not available. I had to read whatever books my older brother could lay his hands on. I was between 9 and 11 years old, and I had difficulties understanding many of the words. It was my brother’s idea to give me thick books, to decrease the amount of mischief I could get into. EBONY: So early on you were introduced to authors and stories from around the world. How did that exposure influence you? NF: I discovered that the Russians were writing about Russia and the French were writing about the French. So early on in my life I thought, wouldn’t it be necessary to write down stories in which Somali names—children’s names and parents’—would appear. EBONY: Initially, it was impossible for you to tell your stories in Somalian. How did you move away from the oral tradition? NF: In a way, tragically I could not [write] in Somali, my mother tongue. Somalia had no standardized script, so one could not write in Somalian. I would be the first one to move away from [the oral tradition] but [not] completely. I go to the oral tradition quite often; it’s a treasure I borrow [from] and informs a great deal of the writing. I love the oral tradition, but I think one must transcend it, because the only person who can hear you is the person in front of you. EBONY: How does the cosmopolitan Somalia you grew up in compare to present day Somalia? NF: Things are terrible [with] the continued absence of the basic necessities in Somalia—in terms of education, in terms of health, in terms of peace, in terms of economic, in terms of everything. The Somali-speaking peninsula of the world is lacking far behind our brethren and sistren in the other neighboring countries. The tragedy of Somalia is, they have been given a life of discontinuity for the past two decades, and that has affected them mentally, psychologically, educationally and socially. EBONY: You were exiled for 22 years from Somalia under the regime of dictator Mohamed Siad Barre. Yet despite being forced out and living in numerous locations—India, South Africa, the United States—your writing primarily centers on Somali. What keeps that fire burning for you? I was only 22, and the only thing I could see was that women were being treated quite badly. Therefore, I wrote about societal dictatorship—[where] within the society are the patriarchs and the matriarchs? A country makes [it] possible for a dictatorship to come rule the country. My argument is, if the people were a reconstructed people, tolerant of one another, willing to listen, more liberal in their views, we would not have suffered the tyranny of a dictator who ruled the country for  years. EBONY: From Elba in From a Crooked Rib to Hiding in Plain Sight’s Bella, you write about women in charge of their own destinies. How do you respond to being called the “Somali feminist” in a region where it’s unheard of for a man to be a feminist? NF: My intentions [are] to show that many Somali women are strong despite [a] society [that] pushes the women to the margin and disenfranchises women. Despite this, it’s thanks to the consistent hard work in Somali women that Somali society has continued to exist. Somali men often engage in [clan] politics. “I am this and I am that and my clan family is that.” This doesn’t help society. Somali women are the ones who have kept the country, and its people survive the greatest odds. They held their heads high and worked very hard to make sure there was food on the table. Some of them had to endure the fact that they had to prostitute their bodies to be able for their families to survive.